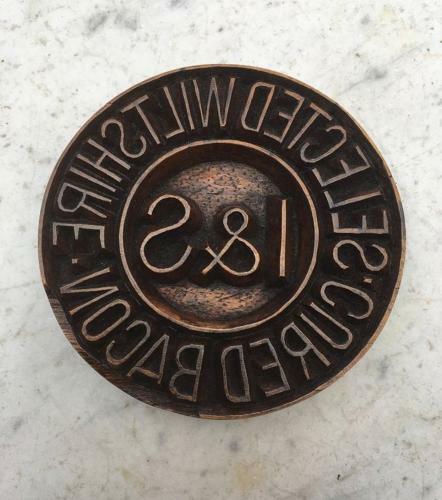 Victorian carved wood (treen) Bacon Stamp...hand carved around the edge "SELECTED WILTSHIRE CURED BACON" with the initials I & S centrally. Wiltshire Cure is a traditional English technique for curing bacon & ham. The technique was developed in the 18th Century by the Harris company. To have "cured" meat it should only be English meat. Great condition for its age (and the use it has had) nibbles around the top edge in one place.